Dubrovnik: Starts May 4, 2019, operated by A320 Tuesday and Saturday. Nice: Commences May 1, 2019, operated by A320 Wednesday and Sunday. 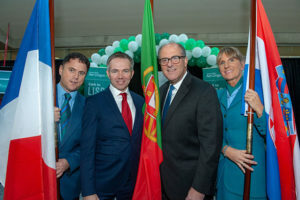 Aer Lingus marked its inaugural flight to Lisbon with the announcement of Summer 2019 services to Dubrovnik and Nice. The airline also announced that the Cork to Lisbon route will be year-round each Monday and Friday. Aer Lingus is the largest airline operating at Cork Airport, both in terms of frequency of flights and seat capacity, operating to to 23 destinations. Next summer, Aer Lingus will increase capacity from Cork to 1,063,000 seats, up 4pc on Summer 2018. In 2019, over 50 routes will now be on offer from Cork Airport across Britain, continental Europe and the US. It’s forecasted that 2.6m passengers will travel through Cork Airport next year.